VAM Endo-MixTM: 7 species of Granular Arbuscular mycorrhizal fungi, resulting in superior plant and root growth. Use in a variety of applications including dry broadcast for turf and farms or add to liquid for hydroponic, irrigation, and hand-watering applications. Use for seed treatments, clones/cuttings, and fortification after making compost tea. Grown In Vivo. No Trichoderma. VAM™ dramatically improves the surface area of your plant’s root mass. This leads to increased nutrient and water adsorbing capabilities. VAM™ includes 7 specially selected species of endo mycorrhizae with a heavy dose of the very aggressive Glomus intraradices. Includes a myriad of ingredients to guarantee the vigor and proliferation of the fungi. Reduce transplant stress as well as establish protection from potential disease pressure. 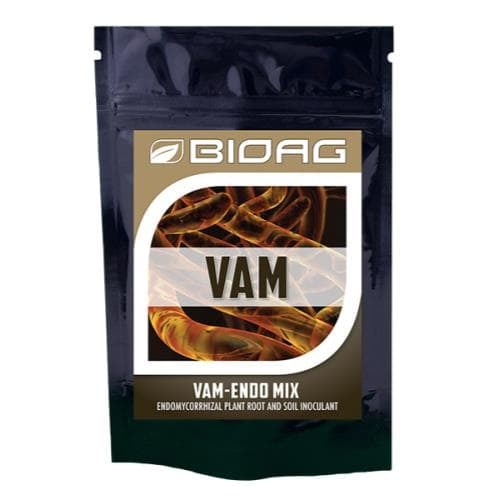 VAM™ contains only endo mycorrhizae.